^^Easter morning we woke up and made pancakes! Isla gave most of her’s to Dasher (eye roll). She doesn’t like to eat solids. For all you mamas out there, is that normal?? I’m getting worried! ^^Kisses for Mr. Bunny (we better keep him away from the fur brother!). ^^One handsome pup. This took a lot of skill to get him to sit for this photo without ripping those ears right off! I’m such a mean mama haha but I don’t feel bad, this is the cutest pic! ^^The sweetest bunny shoes for church I ever did see. 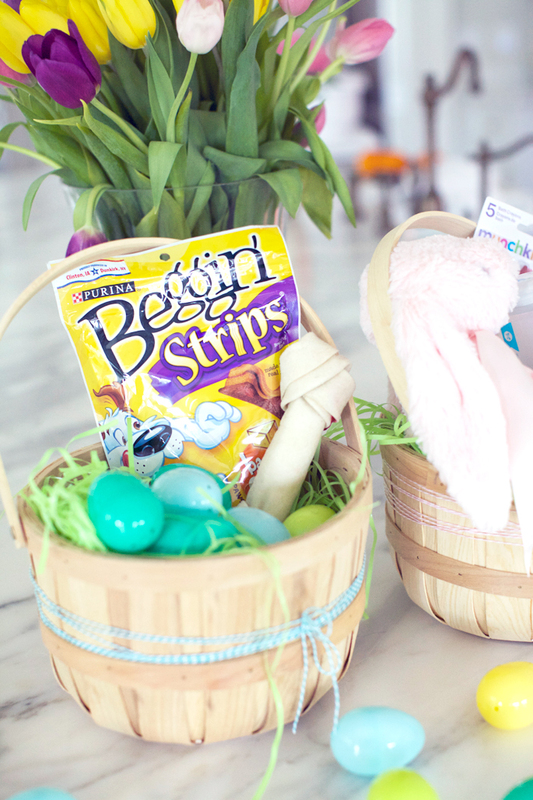 ^^ This is half of Dash’s Easter basket. He stole one of the bones and the fetch balls before I could photograph it. Naughty! 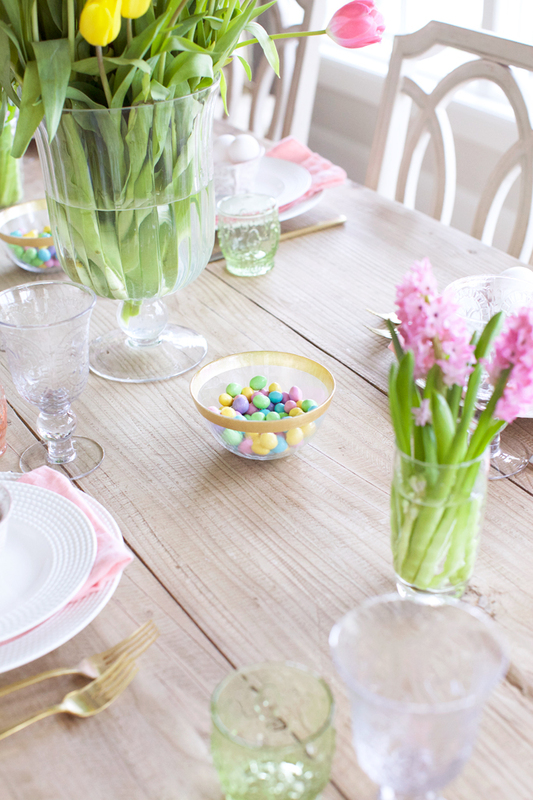 ^^Our Easter dinner setting. I gave everyone their own hardboiled eggs to make themselves since I ran out of time do them myself. Happy Monday everyone!! I hope you all had a lovely Easter weekend! Isla’s first Easter was a success! I can’t believe how magical holidays are with a baby. We had the best few days spending time surrounded with our family and reflecting on the greatest gift, the resurrection of Jesus Christ. I’m grateful to know that because of him I can be with my sweet family forever. The world can be so crazy (and at times scary) but it’s weekends like this that I remember everything is going to be okay and there is a greater purpose for all of us. Your outfit is adorable and perfect for Easter. Love the mix of white and pink. Everything from the dresses to the table settings to the flowers looks gorgeous. 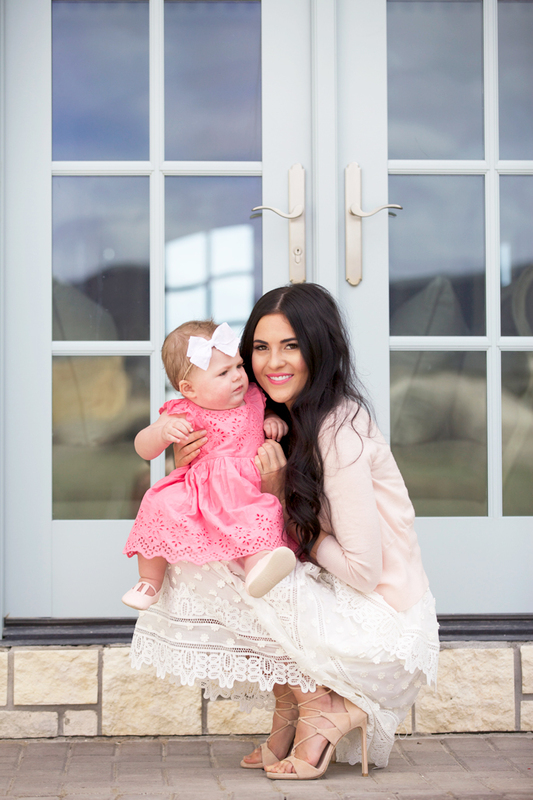 Love Isla’s eyelet dress! Hope you had a great Easter. Love these photos, Rach! Your outfit is perfect, and Isla looks adorable. Glad you had a happy Easter with your family! So gorgeous! Your house is amazing! My son is 13 months and only eats puréed food. I am discouraged as well. I Would love to see what advice your readers give you. Beautiful family! Your daughter looks a lot like Cannon. Happy Easter! You and Isla are the cutest duo! 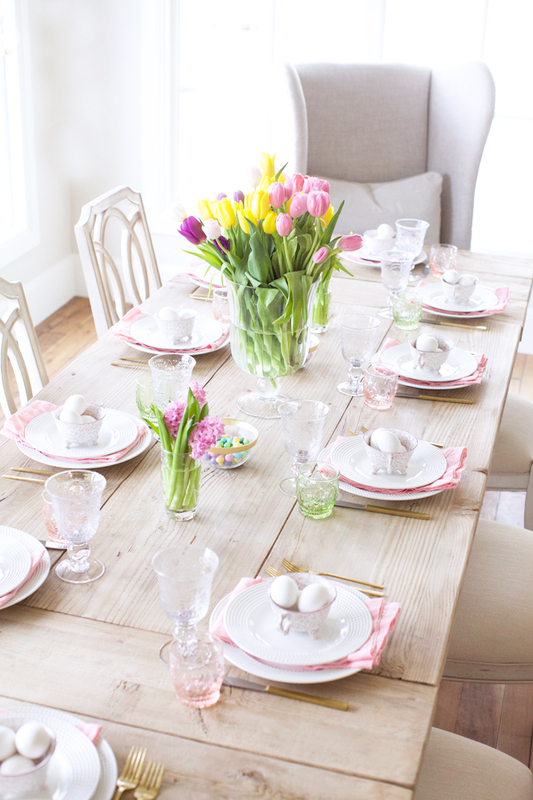 Love your beautiful Easter table! So gorg! Your baby girl is beautiful! Sucha a beautiful family Rachel. Happy Easter! 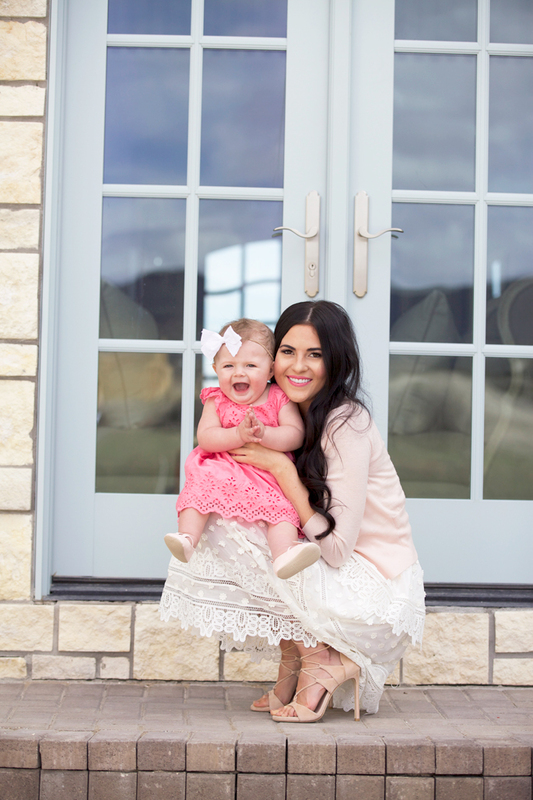 Your dress is gorgeous and little Isla is adorable! LOVE these beautiful photos!! I’ve been eyeing this Self Portrait dress and it looks so cute on you! Hope the family had a wonderful Easter. Dash is just TOO cute. Love the outfits! Beautiful pictures! 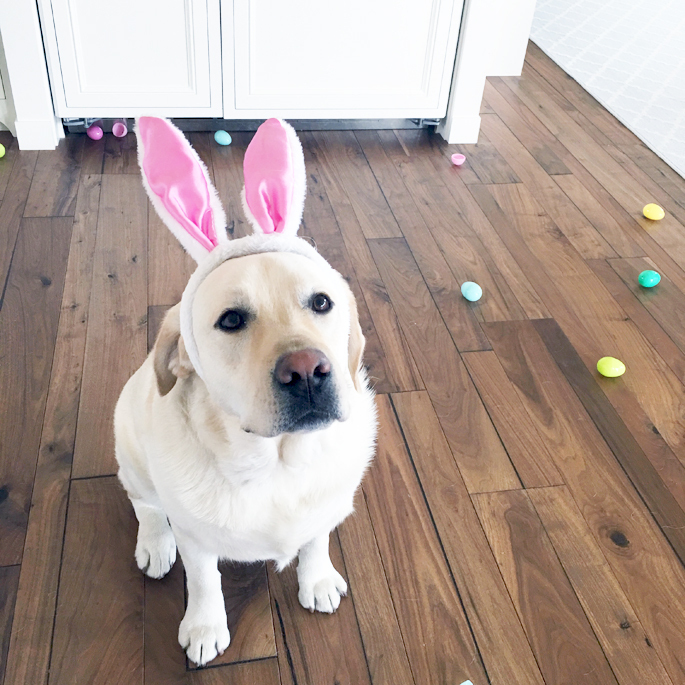 Looks like you had a wonderful Easter! Your family… your sister’s family… just beautiful! What a blessing! Thanks for all the inspiration! Try not to stress about Isla’s eating. Mine are 9 and 6 now. I wish I had stressed less. I’m heading to school lunch now. I never see any of them just drink their milk! Keep offering everything! Ahhhh LOVE them Bunny Shoes!! So beautiful! Thank you for sharing and the reassurance of the feeling of what the resurrection of Jesus Christ represents. Have a wonderful week Rach! Hi, you look great as always. Can you tell me what necklace you are wearing? The bar necklace. Thank you! Adorbs!!! And don’t worry about the solids, my son is 11 months and its still try and fail every day :) sometimes he likes solids sometimes not. Just keep trying! I’m loving that white dress! Happy Easter, Rachel!! Beautiful family as always! Looks like you had a wonderful Easter Sunday! My baby boy was born about the same week as Isla and shows very little interest in any solids, but from what I’ve heard and read it shouldn’t be something to worry too much about. In the first year solids are not so much about filling nutrition gaps as it is about just getting to experiment with textures, flavors, and using their fingers for grasping, etc… Hang in there! That’s comforting to hear :) Thanks for sharing!! What an adorable family you have! To answer your question about her not liking solids. I have three kids. My youngest daughter is two weeks younger than Isla. Yes, it is totally normal. Just keep offering it. My oldest would only eat solids if it was blended until 15 months old. He hated texture. Now my youngest is super picky. She will eat blended solids and some finger foods. We went two months of her refusing solids. Just keep trying. They don’t need a lot to fill them up? you are doing a great job!! 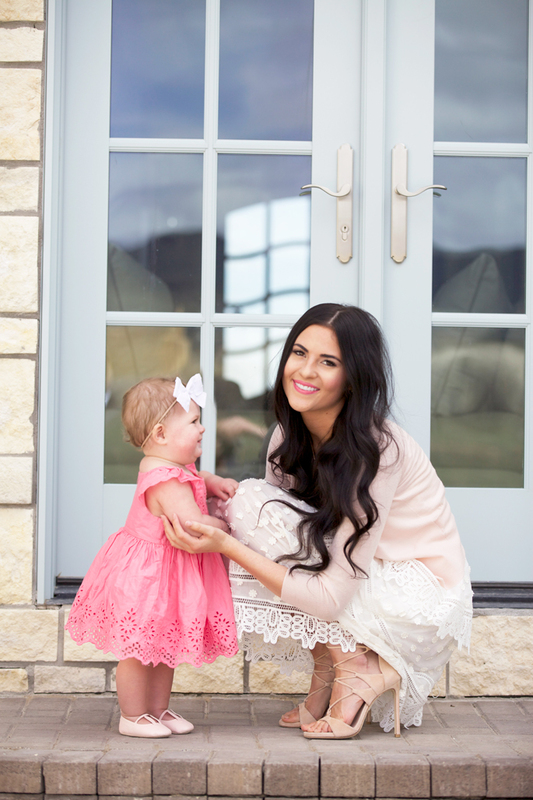 This is beautiful – love all of the pastel colors and coordination! Adorable photos! Love your table setting! 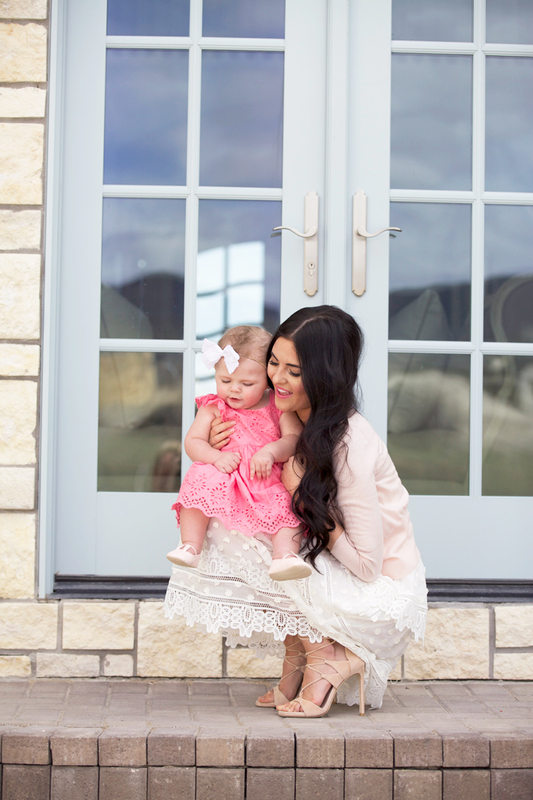 Seriously, cutest Easter pictures. I love the one of Dasher with the bunny ears! Happy to hear you had an amazing holiday. Such gorgeous photos Rach. 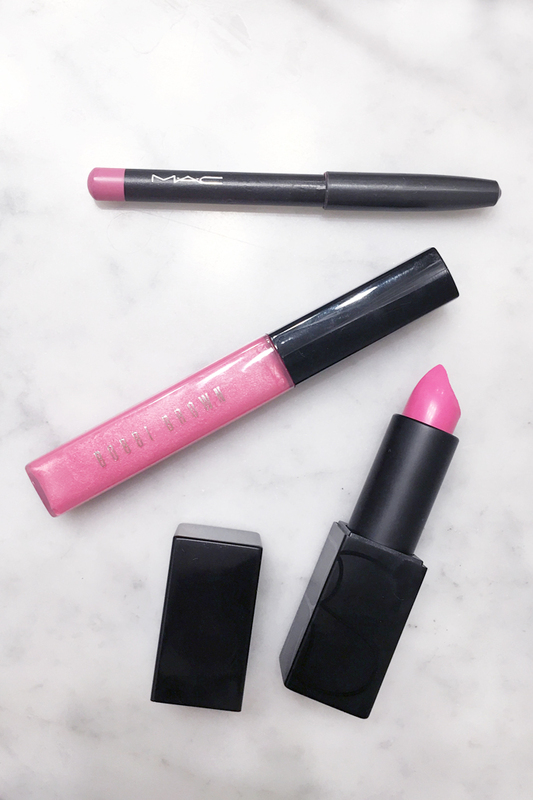 I love all of the pinks and laces! Happy Easter to you and yours! I really enjoy your blog. I have never read a blog..even my own best friends who have them but was drawn to yours from Instagram and just love it!!! Very lovely. I’ve been eye-balling that dress for my son’s baptism but was worried about the lack of coverage on the top. A pretty, lightweight cardigan is a good idea. Amen! Love this post! 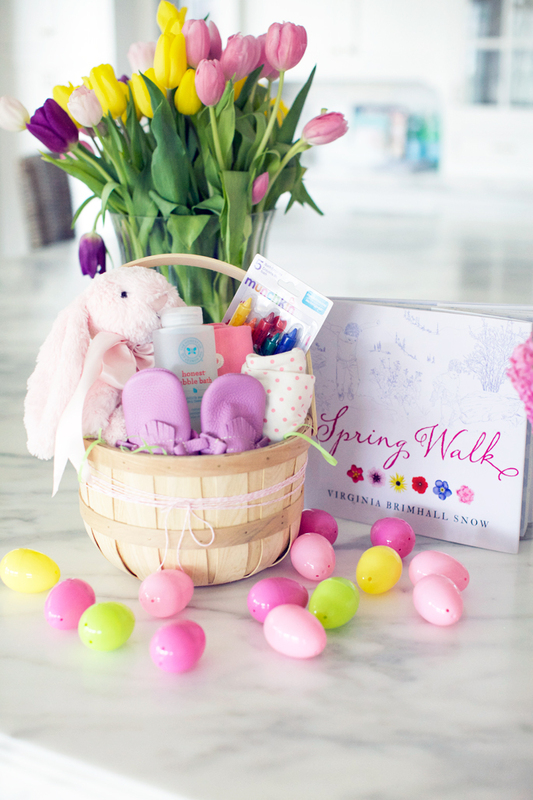 Your little family is so precious and the Easter decorations are so pretty! She is such a sweet baby. I am also christian but orthodox. We celebrate easter this year in May. God bless you and your family. My 11-month old didn’t immediately take to bigger “solids” — he wasn’t in the baby-lead warning group. First I could only get him to eat really puréed foods from a jar, then we did avocado, bananas, things like that. Lately, he loves to watch me take bites of whatever I put on his highchair and then he gobbles it up. Try and be patient. One day they like it, the next day they don’t. Could be teeth, a cold, a texture thing, so just hang in there! You make some really good points!! I’ll just keep trying :) She’ll come around eventually! In response to your question about solids: totally normal. I have a friend with 4 kids that showed no interest until over a year old. My son (who is huge!) barely ate solids until about a year old. If you are really worried mention it to your pediatrician, but she will start eating solids when she is ready. Nothing to worry about, but super frustrating. I think the little one avoiding solids is normal. My niece went through that phase and always preferred her formula and other drinks, which caused he to become quite chubby! It soon passed and we noticed that even so, her appetite for solids was always small. It wasn’t until sometime as she was approaching 3 that her appetite picked up.There are many versions of vitamins you can give her to ensure proper nutrition. I wouldn’t worry, she is so beautiful and looks like a healthy girl. You could mention it to the doc just in case. Such a beautiful dress and love the table setting!!! so pretty! Lovely post Rachel! Happy Easter! For little Isla, try Baby Led Weaning (not the part of her feeding herself at first) but the part of cooking soft veggies and putting a little piece in her cheek for her to learn to chew and move her tongue around. Puffs or Plum Organic puffs work well. Bananas, Avocado, Zucchini, Carrots, Sweet potatoes, little star or veggie Alphabet pasta are great starters. I had the opposite problem, my daughter (10 months) did not like purees. I was so worried, my older child (8yrs) loved purees and transitioned to solids so easily. Ugh, every child is Very different even though I wanted to preach “yeah, but they all do end up doing the same things!”, I learned. Enjoy!! Thank you so much Desiree!! She’s starting to like Puffs more and more so maybe I’ll keep trying those! LOVE this post!! Could those bunny shoes be any cuter?! Beautiful outfits and such a lovely table setting. Gorgeous!! Such beautiful pictures!! My little girl is a week younger than Isla and doesn’t like eating solids yet either! She still nurses full time! Tiring but oh well, she gets what she needs ? Although I am hoping she will start soon! Not nursing around the clock would be great!!! You have a beautiful family! Love the dress! Such a dreamy design. 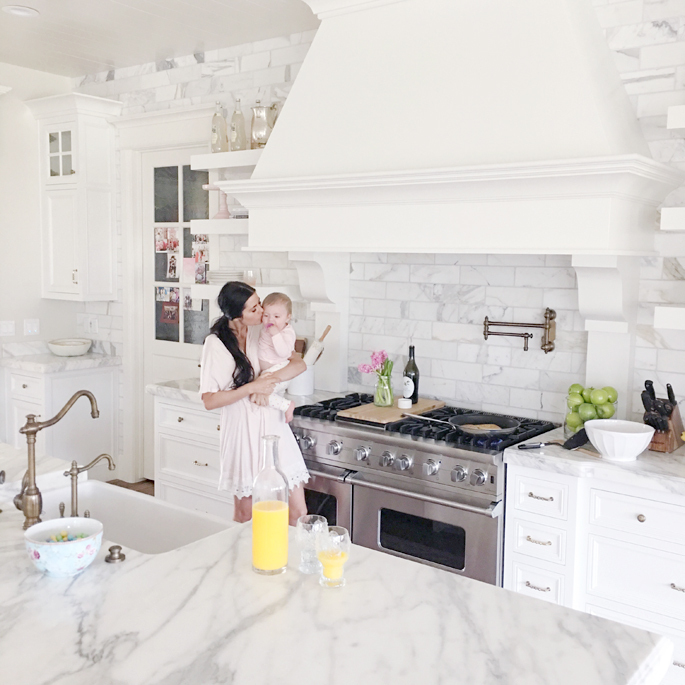 Beautiful Pictures.I love following your family and how Dash is included. Thanks for sharing. Hi Rachel – I would recommend reading the book: French Kids Eat Everything. It was very helpful and informative. Such a beautiful dress! And the cardi is really cute with it. Does this cardi fit true to size or do you suggest ordering up since its fitted? Just stopping in to say you are fabulous, and based on the way Isla looks at you, you are a fantastic mother. Don’t listen to the haters. People looking for fault will find it every time. I admire how you rise above it all. It’s scary how ugky people can be – so in a world full of ugly, thanks for staying beautiful. This is so cute! Major family goals? I got so excited when you “liked” my Instagram Easter pic of my daughter and her boyfriend….I called her at college and told her! Beautiful family! Isla is sdorable!! 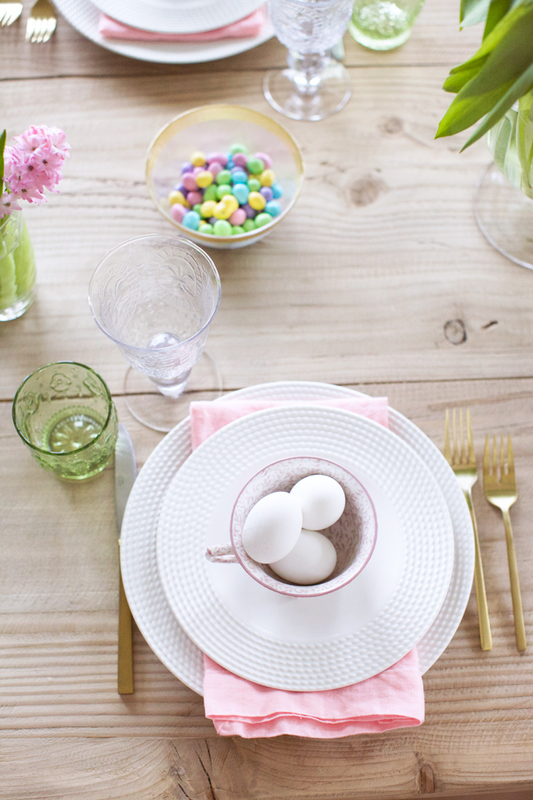 Love your Easter tablescape! I was just curious about the name of the china pattern. It looks a lot like Spode Mansard which I have. I really like it. I’ve been following you for a while and I just want to tell you how much I love seeing those cute little pictures of Isla. That little black and white bathing suit makes me crack up every time. Love it! Long time reader, first time poster… Just wanted to say you look gorgeous and Isla is such a doll. What a beautiful Easter Sunday! Happy belated Easter! lovely pics! Don’t worry about the solids – some kids love it, some hate it, but all of them learn to eat it some day. Just keep offering, try berries – my daughter simply loves blueberries, anything juicy and easy to swallow. Love this post! 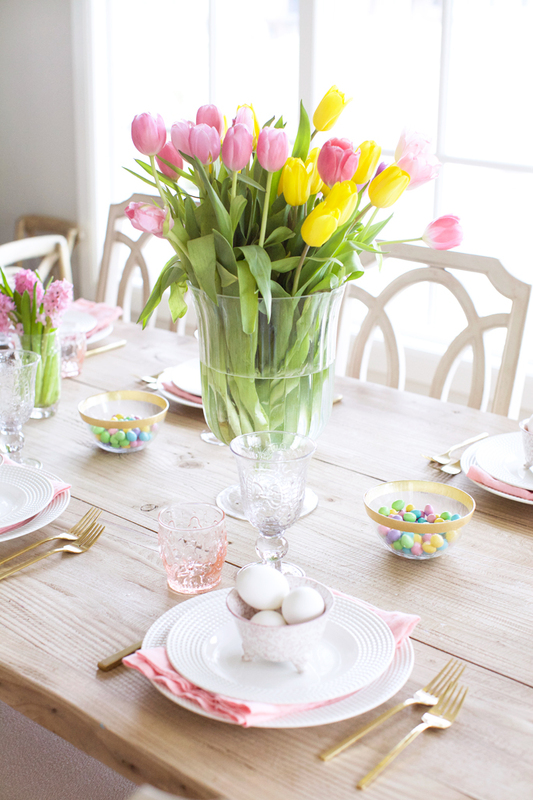 What a beautiful easter setup and your daughter looks adorable! Beautiful photos! I just saw your snap chat about photo shopping. Hang in there, girl! My son is the same age as Cannon and getting a photo with everyone looking at the camera is impossible. We photo shop as well. Don’t let this get you down and this does not make you a bad mother. Who even has the nerve to say this to another person? What a beautiful table scape! Love the dress too! Rachel, just saw your snapchat about the haters commenting on the minor photoshop….your family is beautiful your blog is awesome and do not let people with nothing better to do and nothing positive to say get to you. Most certainly don’t feed her negative behavior. I wouldn’t even acknowledge their ignorant comments. God bless you and your family. Everything was beautiful and perfect. I am so in love with your lace dress!! Looks like you guys had a wonderful Easter! Beautiful pictures. Thanks for posting. You’re all gorgeous. Thanks for the decor inspiration too! Looks like a wonderful Easter! On the solids…my son is 15mo old now but I kept a mini food processor on the counter and would lightly chop up whatever we were eating for meals. Its a great tool because you can control the consistency and amount. The mini (prep) processors are a great size for small amounts. I also tried to be diligent on letting him explore with sizes of food. Large pieces of avacado he could mash on, the end of a banana with the peel cut off, etc. Not exactly ‘baby led weaning’ but a hint of it. Rice, beans, small items work good for the first while. I also found boiling baby carrots then cooling them in the fridge was a huge hit. The carrots are soft and easy to chew plus the cold helps with teething. She will be just fine but keep working at it. Being a parent is so wonderfully beautifully hard:) Ciao! Some babies are super stubborn when it comes to food! I am no expert, but I found that patience and consistency were key with my baby. As long as i kept trying and didn’t give up no matter how much she fussed, she eventually learned to love solids! People around the internet think they know best and have the best opinions… but your pediatrician will always have the right answer for you!! Good luck Rach, Isla is precious!! Thanks for the advice Hannah! I really appreciate it. 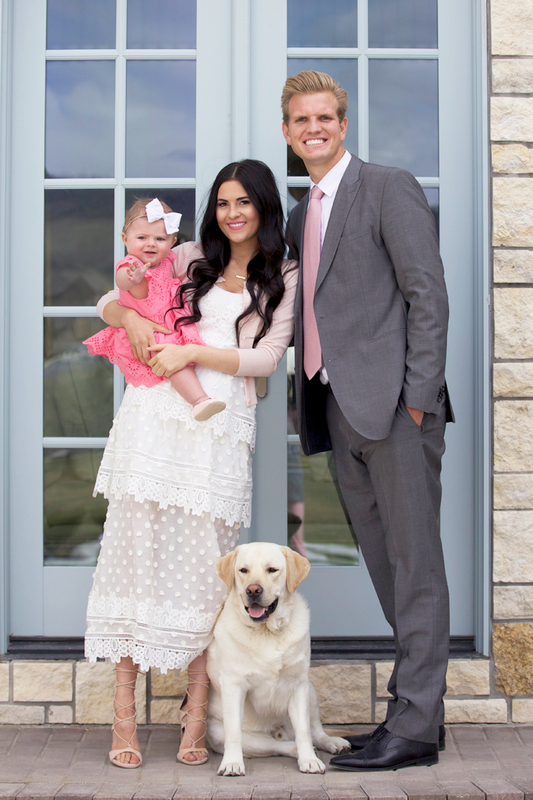 I love seeing photos of you and your adorable little family! so cute! Can you please share where you bought these cute baskets? I love how natural and simplistic they are. I got them at Target!! 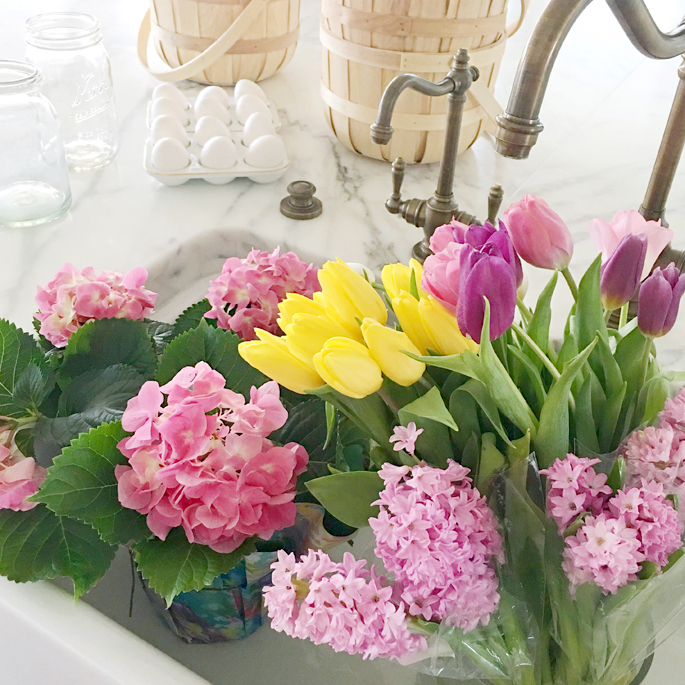 I hope you had a beautiful Easter!